The state of South Carolina has a points system in place for its drivers. Every driving infraction or violation results in points against your driver’s license. As you accumulate points, not only do your insurance rates go up, but you could also lose your license or face mandatory suspension. 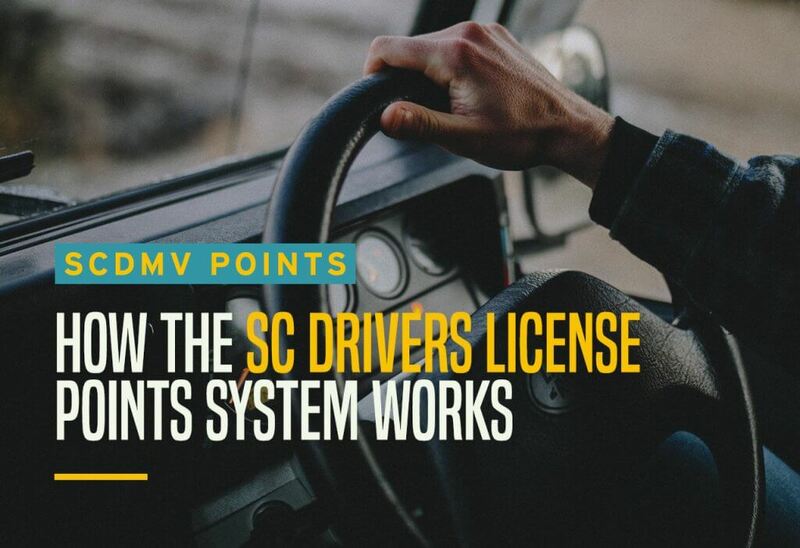 Understanding how the point system works is imperative for all South Carolina drivers. How Many Points is Each Violation Worth? Drivers can have points added to their record for just about any moving violation and even a few non-moving violations. For example, speeding can run you anywhere from 2 to 6 points, depending on just how fast over the speed limit you are going. Improper parking costs you 2 points. Most infractions are worth 4 points, but you can find a full list of infractions and their point totals here under the subheading “violation points”. You can also find a list of common infractions and their point totals here. It’s important for you to know that points will only be added if you plead guilty or are convicted of the traffic offense. Any ticket that is dismissed will not result in points added. What Happens If You Get Too Many Points? After accruing your first six points, the state sends a friendly letter advising you to drive more carefully. If you accumulate more than 12 points in two years, your license is suspended for three months. If you accumulate more than 20 points in the same timeframe, your license is suspended for six months. If getting your license suspended for what may only be two tickets in two years sounds like a scary prospect, keep in mind there are steps you can take to reduce the number of points on your record. If you have points on your SC license, you may get up to four points removed by taking a defensive driving course. To qualify for point reduction, the class must meet the standards set by the DMV. Some of the requirements include the length of the class, the format of the class, and the location of the class. Check out our blog post to find available defensive driving courses in Greenville. It’s also important to note that the class won’t work if the points haven’t hit your record yet. For example, if you take an approved driver’s safety class in June and the points don’t hit your record until July, you won’t see any reduction. You also must use caution about when safety courses because they are only effective in reducing your points total once every three years. Fortunately, points don’t stay on your record forever. For one year from the date of your infraction, the points are counted at their full value. After one year (12 months), the offense will only carry half of the originally assigned points. After two years (24 months), the points will “fall off” of your record and won’t count against you anymore. Basically, if you have six points in June of 2018 and don’t receive any other tickets, you will only have three points in June of 2019. In June of 2020, your record will show zero points. If your license does get suspended, you still have a couple of options. You have ten days to challenge the suspension, but this may require a lawyer and related fees. You can also apply for a route-restricted license that will allow you to travel to and from work and school only. If your license gets suspended, make sure that you really cannot do without a license before you apply because you will only be able to get it once in your lifetime. You also must stay diligent and update the DMV immediately with any changes to your address, school, place of employment, or work hours because driving outside of your designated routes or times can result in a charge for driving under suspension, which will only magnify the problem. At first glance, the driving points system in South Carolina seems complex, but it is relatively easy to navigate once you know the basics. If you’re ever in doubt, contact the DMV or a local traffic lawyer’s office. These resources can give you any information that you’ll need to keep your record clean and your license active. Keeping points off your license is the surest way to keep your auto insurance cheap and affordable. For free car insurance quotes in Greenville or elsewhere in South Carolina, contact Upside Insurance today.